The Campus District Observer newspaper is making a transition after January to a digital format with our new e-news “In the Campus District” to be sent out bimonthly and supported by an online website home. You’ll find the same great stories about what’s happening in the district, the interesting people who live and work and go to school here, and events that you don’t want to miss. The Campus District is grateful to our editor for the past year, Donna Dieball, and our graphic designer, Steve Thomas, for their great work. Donna is going back to school full-time and Steve, who does our beautiful layout, continues as a freelance graphic designer. You can contact him at sthomasdesign@icloud.com. Stay on top of life in the Campus District and sign up to receive our e-news at www.InTheCampusDistrict.org . Be sure to let us know if you want to contribute a story or calendar item or advertise in it by emailing breichtell@campusdistrict.org. life and developments in the district as well as our events calendar. I want to personally thank our editor Donna Dieball, who for the past year has done an awesome job at coordinating the paper and writing stories to keep our readers informed. The timing for our transition is perfect as Donna is going back to school full-time to study court reporting and captioning. I also want to thank our free lance graphic designer Steve Thomas, who does the terrific layout work for us. I also thank our talented volunteer writers and photographers who have contributed over the past two and a half years to this paper. Finally, and most importantly, thank you to the Sisters of Charity Foundation and our generous advertisers who have brought this paper to life, enabling the paper to be brought to our readers free of charge. Thank you! We will continue to seek your involvement with “In the Campus District” e-news and web site. Stay tuned to what’s happening in the district and to the exciting work of Campus District, Inc. at www.IntheCampusDistrict.org and at our website CampusDistrict.org and on facebook at www.facebook.com/CampusDistrictInc. A rendering of the new housing building facing Euclid Avenue. Photo courtesy of www.cleveland.com. Last month, the Cleveland City Planning Commission approved plans for the demolition of two landmark Euclid Avenue buildings – the Jewish Federation Building and the Playhouse Square Building (also known as the Rogers Building) at 1720 and 1750 Euclid. Clayco Realty group will be constructing new student housing units with a connected parking garage. Clayco Realty, a Chicago-based full-service development and construction company, was drawn to the location because of the area’s ideal infrastructure, transportation and nearby student amenities as well as the increasing enrollment at Cleveland State University. Vice President of Development Rob Lochner and other associates from Clayco Realty presented designs for the new housing and garage space at a December design review meeting at City Hall. As this is the final print version of the Campus District Observer, the Campus District, Inc. would like to extend a warm thank you to all past writers, photographers and contributors. You have all shared your valuable time and efforts in helping us spread positive awareness of the Campus District and its surrounding communities. We appreciate you! Vivian Maier. Photo courtesy of www.clevelandprintroom.com. 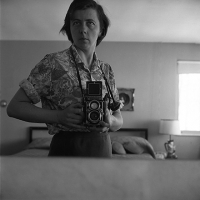 The Cleveland Print Room is proud to present Vivian Maier: Out of the Shadows, an exhibition of photographs by Vivian Maier (1926 - 2009) from the Jeffrey Goldstein Collection. The exhibition of posthumous silver gelatin prints puts Maier’s work in the context of her life during her creative period from the 1950s through the 1970s. This is the first time Maier’s impressive body of work and unique story will be shared in Ohio. Prior to the general public opening on January 10, which will consist of a smaller selection of the traveling exhibit due to our gallery's space limitations, we will be hosting an exclusive expanded, full-exhibit preview showing for one night only as a fundraiser for our nonprofit community access darkroom, educational center, studio workspace, and photographic gallery. This special full exhibit preview showing, catered by area restaurants, will take place on Thursday, January 9 from 5 to 9 p.m. A limited number of admission tickets to this special event are available for $50 by calling Shari at 216-401-5981. Cleveland State University hosted a groundbreaking ceremony December 9 for its new health sciences building, set to open in 2015 on the corner of Euclid Avenue and East 22nd Street. From left are Robert Rawson Jr., chairman of the CSU Board of Trustees; CSU President Ronald Berkman; Northeast Ohio Medical University President Jay Gershen; and Cleveland Mayor Frank Jackson. 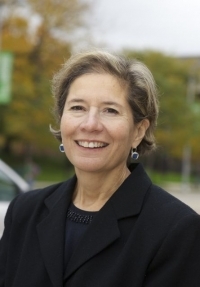 Cleveland State University (CSU), in conjunction with Northeast Ohio Medical University (NEOMED), is pursuing a bold new collaborative approach to health-care education. CSU broke ground last month for a health sciences building that will be a state-of-the-art facility where future physicians, pharmacists, nurses and other health professionals will learn to work together at the forefront of collaborative health-care education and research. In addition to housing CSU programs offered by the School of Nursing and the School of Health Sciences, the building will also house the Cleveland cohort of NEOMED’s programs within their College of Medicine, College of Pharmacy and College of Graduate Studies and will serve as the home of the NEOMED-CSU Partnership for Urban Health, a partnership dedicated to training physicians and other health professionals that deliver primary care services to address the unique health-care needs of metropolitan communities. 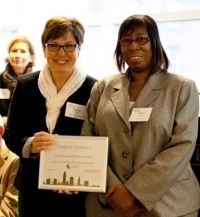 Cuyahoga Community College (Tri-C) hosted the graduation of 36 Cleveland area small business owners from the Goldman Sachs 10,000 Small Businesses program last month at the Tri-C Metro Campus Advanced Technology Training Center (ATTC). Allen Lucarelli, lead faculty member for 10,000 Small Businesses at Tri-C, offered brief remarks and John Kropf of Growth Capital Corp. gave the keynote address. In addition, two graduates nominated by their peers shared their stories: Matt Radicelli, founder/owner of Rock the House Entertainment, and Alec McClennan, president of Good Nature Organic Lawn Care. 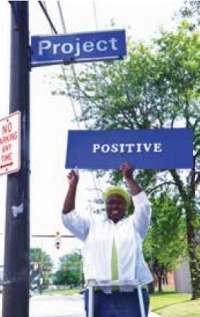 La Queta Worley holds up a sign for "Positivity Street." A street name doesn’t define a person. Yet a name like Project carries a lot of negative connotations that can be hurtful to the people who live there. For 13 years La Queta (Keeta) Worley lived on a street named “Project”. She hated the name. Although she no longer lives on that street she still hates the name. Recently La Queta and I shared a conversation about our dreams for the Central neighborhood. I mentioned that I would love to see the Project street sign taken down. That’s when I learned that she had previously lived on that street and has wanted the same thing for many, many years. I know I would have brooded about that sign every time I saw it but probably wouldn’t have done anything about had it had not been for La Queta. When two or more people come together to share their dreams and aspirations, courage, energy and power are magnified. More than 700,000 people receive total knee replacement surgery annually in the United States, making it the most common joint replacement surgery. Increasingly, younger patients such as Baby Boomers are opting for the surgery. 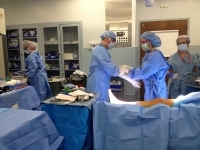 St. Vincent Charity performs more than 350 total knee replacement surgeries annually. Under the guidance of Lou Keppler, MD, orthopedic surgeon and Co-Director of the Spine and Orthopedic Institute at St. Vincent Charity Medical Center, we were able to share with a virtual audience what happens when surgeons replace a total knee joint. A friendly volunteer assists a client with tax preparation. Free tax preparation is the gateway to financial stability and service for thousands of working families. Most low-income families are eligible for a tax refund, which is their largest source of income all year – often one-fourth of their annual income. The Earned Income Tax Credit (EITC) is largely responsible for making tax time so crucial. The EITC is the largest poverty relief program in the country, aimed at helping families with children provide basic needs and save for the future. What’s more, free tax preparation increases tax compliance by encouraging families to file their taxes on time and accurately. More than one-fifth of eligible EITC filers do not claim the credit or do so incorrectly. Free tax preparation not only helps with EITC claims and accurate returns, but also provides an entry point for families to become better banked, determine eligibility for and claim public assistance, and receive financial education. Looking for fun things to do around the Campus District? Check out our list of upcoming events! Wendy Hoke, a member of the executive committee of the CDI board and senior director of marketing and communications at St. Vincent Charity Medical Center, presented the Outstanding Leadership Award to Councilwoman Phyllis Cleveland for her work on the East 22nd Street infrustructure project and the CMHA Choice Neighborhood Plan. 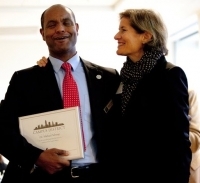 Over 100 civic leaders, business people, anchor institution representatives and community stakeholders filled the Community Room at the Plain Dealer on November 22 to attend the Campus District, Inc. Annual Meeting. The meeting also commemorated the 30th anniversary of the founding of the St. Vincent Quadrangle in 1983, which eventually became the Campus District, Inc. (CDI). Dr. Michael Schoop, president of the CDI Board of Directors (president of the Cuyahoga Community College Metro Campus), welcomed the audience and introduced Bobbi Reichtell, executive director of CDI. Reichtell gave a report on the work of the Campus District over the past year and the recent large investments in the Campus District by private developers and institutions. She pointed to the student housing opportunities that are continuing to expand with a warehouse in the Superior Arts Quarter being renovated by Dave and Karen Perkowski to provide loft units to accommodate 140 students, adding to the new 600-bed Langston apartment project on Chester Avenue developed by Guy Totino of Polaris Real Estate Equity and Buckingham Properties. 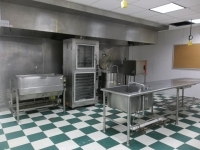 Thirty years ago in 1983, the leaders of Cleveland State University (CSU), Cuyahoga Community College (Tri-C) and St. Vincent Charity Hospital came together to create an entity for community improvement. Together with other community and business leaders they founded the St. Vincent Charity Quadrangle – later shortened to the Quadrangle – to become what is now known as Campus District, Inc.
Over the years the group improved safety in the district, offered child care to its employees, marketed the area to attract development and made several plans on how to bridge the Innerbelt trench that sliced through the neighborhood in the early 1960’s. As you are reading this, November elections are over and I have been re-elected for my third term to Cleveland City Council. 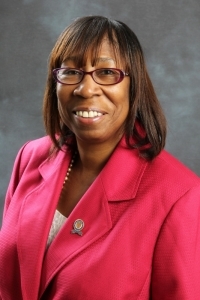 The election came with changes in ward boundaries throughout the City of Cleveland. Ward 5 now includes all of Cleveland State University (and other parts of downtown). This is very exciting for me as I get to work with more of the Campus District community. Several projects and initiatives loom brightly. I will continue to champion the East 22nd Streetscape, as this corridor is key to bringing Cleveland State and Cuyahoga Community College into closer alignment. This alignment is more than physical, as it will create the most vibrant education hub in our region. Cuyahoga Metropolitan Housing Authority's Choice Neighborhood Plan will be a game changer, completing the build out of lower Central in a significant way. Choice supports the redevelopment of the dilapidated Cedar Extension Family Estates with mixed income housing, creation of retail business and more neighborhood-based initiatives. Photo courtesy of CMSD Communications. The Cleveland Metropolitan School District's MC2STEM High School is complete now that its juniors and seniors have found a permanent home on the Cleveland State University campus. The innovative school, which specializes in science, technology, engineering and mathematics, celebrated at a grand opening last month, along with leaders from the district, Cleveland State University and KeyCorp. The KeyBank Foundation contributed $1.25 million to renovate space for the students on two floors of Rhodes Tower and has given more than $2.5 million to STEM education in the district. The facilities at CSU include a "fab lab" equipped with computers linked to laser-powered cutters and other machinery. St. Peter Church was constructed between 1857 and 1859. It was patterned after the German Hallenkirche, or hall church, by many devoted German immigrants. The Cuyahoga Metropolitan Housing Authority Police Department began its “Police Assistance Referral” program about three years ago, and since then nearly 4,600 CMHA residents – primarily in the Central Neighborhood – have benefited. The referral initiative shifts police-citizen relations and recognizes that police are usually the first responders to social crises. "Eighty percent of police officers respond to non-arrest situations, and the CMHA police are no different,” said Michael Walker, executive director of Partnership for a Safer Cleveland, a non-profit dedicated to increasing safety and providing developmental opportunities through collaborative initiatives. Police Assistance Referral gives CMHA officers another tool, and the family they're dealing with options. Recognizing the long-term effects violence has on children and families, CMHA police connect them with FrontLine Service (formerly Mental Health Services). Frontline contacts the family within 24 hours of the event to provide consultation, information and ongoing support for those who want it, working with adults and children to overcome trauma as well as connect them to other appropriate agencies and services. Cleveland Public Library Asks: "What Do You Want to Do Before You Die?" Interactive exhibit offers visitors the chance to share their hopes and dreams. CPL joined communities in New York, Memphis, Milwaukee, Little Rock, and Monterrey, Mexico to celebrate “A Day of Walls” on November 5. The event coincided with the release of the Before I Die book, which features photos and stories from Before I Die projects around the world. CPL will periodically photograph the installation and share the results online. 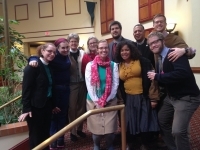 Members of the Trinity Urban Service Corps pictured with Rev. Sahra Harding, Very Rev. Tracey Lind, and Rev. Canon Will Mebane. Visit www.trinitycleveland.org/urban-service-corps to find out more about the group's mission. One of eight interns working as a Trinity Urban Service Corps member in Cleveland has had to exit our program, which began in late August, due to family circumstances. As a result, we are recruiting for a replacement participant with a college degree or the equivalent and who is familiar with the Protestant Christian tradition, to begin as soon as possible. The 40 hours per week are spent developing the house community of interns living in the Detroit Shoreway-Gordon Square district of Cleveland, Ohio, and the worksite would be based on the intern’s skills and interests. Housing, health insurance, transportation costs and food costs are provided through July 31, 2014. A personal stipend of $300 a month is included. If you are available and interested in joining our mission of developing leaders for the civic community then please contact the Rev. 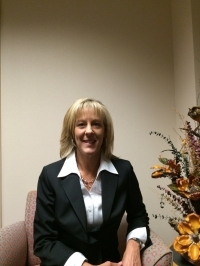 Sahra Harding as soon as possible at sharding@dohio.org. Visit our website for more details about the program and the current interns that are involved: http://trinitycleveland.org/urban-service-corps/. The Choir of Clare College, Cambridge. Photo by Nick Rutter. The Choir of Clare College at Cambridge University is coming to Cleveland! This small, not-to-be-missed choir of twenty-nine students enjoys a reputation as one of the top mixed voice collegiate choirs in the world. Selected by competitive auditions even before coming to Cambridge, these young talented musicians perform with the clear, moving sound that has made the British chapel choir tradition famous around the world. Dedicated and busy, the singers – known officially as “Choral Exhibitioners” – learn vast amounts of music each term, leading Choral Evensong services three times each week in the college chapel. They quickly become confident sight-readers, as rehearsals are brief and intense and there is little time for mistakes. Clare College, founded in 1326, is the second oldest and now one of the most musically renowned of the 31 colleges that make up Cambridge University. Its now-famous choir was founded in 1971. Its second and most internationally recognized director, John Rutter, held the post a brief time before demand for his compositions became too great. (top) Susann Castore in full Kindness Ambassador attire. (bottom) Castore shares a handful of smiles. Photos provided by Susann Castore. Last month, the “A-OK Lady” paid a visit to the Campus District, bringing with her a message of kindness and a large supply of small plastic smiley faces. Susann Castore, a self-proclaimed Kindness Ambassador, is the founder of HopeScapes 501(c)(3), an outreach program created to help individuals find motivation to overcome obstacles and make meaningful connections with others. Early this year, Castore embarked on a journey across Ohio as part of the Kindness Exchange Campaign. Her mission: to connect people from all walks of life through compassion, hope and kindness. Over the course of her campaign, Castore has given talks at community festivals, homeless shelters and mental health facilities all over the state. She won’t hesitate to share her message with people she passes on the street. Her bright red cape, floral pants and giant cardboard smiley face may seem off-putting at first. However, after a few minutes of interaction, it’s easy to sense the passion with which she works and to feel the warming effects of her message. Castore’s stop in Cleveland brought her here to the Campus District. 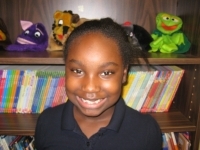 She shared her kindness and good cheer during a visit to the Cleveland State University Office of Civic Engagement. Central's favorite turkey extends his holiday greetings! This little guy has become a well-known sight in the Cedar-Central community over the past four years. Maybe you've spotted him around the Tri-C Metro Campus, one of his frequent spots. Affectionately known by many as "Lester," this turkey has made himself right at home here in the Campus District. 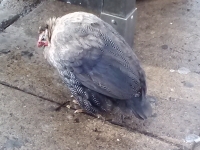 He's quite friendly and not at all shy about seeking out a free meal! I was up to the challenge because I have seen first hand the quality of the work that Tower Press Development has done on other buildings, with the help of state historic preservation tax credit programs. With Thanksgiving approaching, we thought we’d do a feature on gratefulness. We asked some of the students at the Campus International School to tell us what they are grateful for and we are sharing their sweet answers with you in this issue. A group of people who care deeply about the future of this district of downtown Cleveland. They demonstrate it through their gift of time, serving on the Campus District Board of Directors and committees, and through their financial contributions to the organization. (See their names in the box to the right.) Lead by our Chairman of the Board Dr. Michael Schoop of Tri-C Metro Campus, they recently completed a strategic plan for the organization that proposes exciting things for our future work in the district. We will be sharing these plans at our annual meeting on November 22. If you are interested in attending, please call our office at 216-344-9200. People who volunteer to make the Campus District a better place. We have so many people contributing in so many ways throughout our community. A sampling of what they do: attending community meetings about safety improvements along Superior, volunteering as Promise ambassadors in the Central neighborhood to help children succeed in school and life, writing articles and taking photographs for our Campus District community newspaper, planting a perennial flower garden on the East 30th Street median strip, walking and biking the District with surveys to help us determine how to make our neighborhood more bikable and walkable, and the Men of Central who are helping children in the Central neighborhood schools with tutoring, reading and being a positive presence where needed. There are many more doing great work. Volunteers from the October 12 planting session. 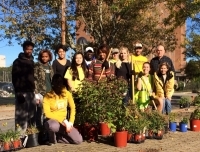 Last month, the Campus District organized volunteers from the community, CSU, Tri-C and the Trinity Cathedral Urban Service Corps to create two test plot perennial beds in the East 30th Street median strip. Twenty-five volunteers weeded, removed bricks and sand, laid topsoil, and planted beautiful perennials in two 5’ x 10’ planting beds. The flowers planted were voted on by residents of the Cedar-Central neighborhood at a recent East 35th Street block party. The perennials planted on October 11 and 12 have taken root, and hopefully will come back even stronger next spring. Ron Hartmiller of the Garden Club of Greater Cleveland led the volunteers, and Brittany Barski, horticultural specialist with CMHA, designed the planting plan. Alumni of past Neighborhood Leadership Institute training programs. The Neighborhood Leadership Institute is looking for participants for its 30th leadership training program. All individuals with expertise and unique perspectives who want to learn more about being involved in the community are encouraged to apply. The program will consist of a 19-week course that will run from January to May in 2014 and will be a partnership with Cleveland State University. Classes will take place Thursday nights from 5:30 p.m. to 9:30 p.m. at the Maxine Levin College of Urban Affairs. Throughout the course of the program, participants will take part in retreats, group projects, coaching and neighborhood tours. If you’d like a chance to identify your personal strengths, tools and resources while learning the fundamentals of grassroots leadership, then this program is for you! Perhaps you know a leader with impressive dedication and good intentions. Maybe you feel this person could benefit from having new tools added to his or her leadership toolbox. If you believe that you or someone you know would be a good candidate, visit www.neighborhoodleadership.org to find out more. You can also call 216-812-8700 if you’d like to receive a brochure in the mail. The Neighborhood Leadership Institute has over 1,000 alumni who are helping to improve the quality of life for people all over Cleveland. You can help make a difference, too! 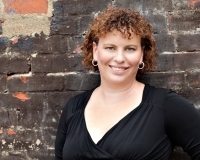 Anne Trubek. Photo courtesy of www.trinitycleveland.org. Trinity Cathedral will have a Dean's Forum Sunday, November 24 at 10:10 a.m. with Anne Trubek of Rust Belt Chic. 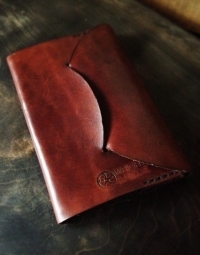 Rust Belt Chic Press is a creative-based Cleveland small business. It is a print book series and an online platform for high-quality edited literary work. It is an ideal that binds creative minds living in the post-industrial Midwest. It is a method by which its organizers create, collect and disseminate the stories and written history of the city of Cleveland. Music and Art at Trinity Cathedral’s BrownBag Concert Series continues through December 18. The BrownBag Concert series runs weekly (See full schedule below.) Guests are welcome to bring a lunch or purchase one for $5. Concerts range from jazz to classical chamber music, big band, pipe organ with brass and much more. All programs take place in the beautiful Gothic nave of Trinity Cathedral. There is no admission fee – a freewill offering is taken at each concert. The Trinity Commons parking lot entrance is on Prospect Avenue at East 22nd Street. Overflow parking is available in the Cleveland State University Prospect garage. Parking is free. Music and Art at Trinity Cathedral is a multi-faceted community arts organization that produces a free Brownbag Concert Series, collaborative arts programs, the annual Medieval Feast, and a variety of other arts-oriented programs, sometimes in conjunction with other organizations. Each season, Music and Art at Trinity Cathedral produces or presents more than 40 events in the areas of music, dance, literature, theatre and the visual arts. Music and Art at Trinity Cathedral is led by Todd Wilson, Director of Music and Worship. Examples of wet plate collodion portraits. Photo provided by Shari Wilkins. The Cleveland Print Room (CPL) - a community dark room, educational space, studio workspace and photographic gallery - will be holding portrait sessions early this month. The Wet Plate Collodion Portrait Sessions will take place Saturday, November 9 and Sunday, November 10. CPL is bringing the historic process of wet plate collodion tintype/ambrotype portraiture to Cleveland, 160 years after its invention, just in time for the holiday season. Cleveland artist/designer and CIA graduate Greg Martin will be taking portraits by appointment only. 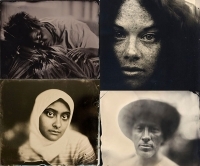 Greg has been practicing the art and craft of wet plate collodion photography for the past eight years, and his award-winning work has been exhibited in numerous shows throughout the region. Tintypes, often considered the Polaroid of the 19th century, are made quickly in a process that uses hand poured chemicals on an enameled metal sheet. Valued for their archival stability in the digital age, tintypes were historically passed down in families as heirlooms. Greg was taught the period-authentic method and uses the same materials, equipment, cameras and lenses that were used back in the 1800's. Come meet with and view the photograph of members of the American Society of Media Photographers (ASMP), Northeast Ohio's top commercial photographers. An opening reception for the show will take place Friday, November 15 from 6 to 9 p.m. There will be a free drawing for a Cleveland Print Room Membership. The Ohio North Chapter (ONC) of ASMP serves photographers of Northeast Ohio by providing camaraderie and educational venues and also by promoting high standards and sound business ethics. Membership provides an array of photographic specialties including commercial and studio work, portraiture, editorial, aerial photography, fashion, architectural imagery, and many other areas. To learn more about this chapter, visit www.asmp-onc.org. Following the November 15 reception, the exhibit will run through November 25. Gallery hours are Tues., Thurs., Sat. from 12 to 6 p.m. and Wed. 3 to 6 p.m. The Print Room can be accessed using the middle door in the front of the ArtCraft Building at 2550 Superior Avenue. Street parking is available in front of the building. A secure, well-lit parking lot is also available on Friday and Saturday nights. For questions about the event or to learn more about the Cleveland Print Room, call Shari Wilkins at 216-401-5981 or visit www.clevelandprintroom.com. Trinity Cathedral Advent Retreat: Who is This Stupendous Stranger? Reverend Martin Smith. Photo courtesy of www.trinitycleveland.org. The Reverend Martin L. Smith will lead an advent retreat Saturday, December 7 from 9 a.m. to 4 p.m. Cost of the event is $35, which includes lunch. The retreat will focus on the question: Who is this Stupendous Stranger? This challenging question is inspired by the opening line of a great Anglican hymn celebrating the Incarnation. In this quiet time for reflection and prayer we will open the question for ourselves. Let’s be amazed all over again by the good news of God’s plunge into human embodiment in the person of Jesus and appreciate again why the Incarnation is at the heart of Anglican Spirituality. Martin L. Smith is well known throughout the Episcopal Church and beyond as an interpreter of contemporary spirituality through books such as A Season for the Spirit, The Word is Very Near You, Reconciliation, Love Set Free, Compass and Stars, and as a preacher and leader of retreats and workshops. He has recently co-written with Dr. Julia Gatta Go in Peace: the Art of Hearing Confessions. His recent retirement from the staff of St. Columba’s, Washington, enables him to continue his wide-ranging ministry of teaching and writing. View the full article to read more responses. Accompanying photos sent in by responders can be viewed in our holiday photo blog. Cuyahoga Community College (Tri-C) Veterans Initiative officially introduced its new Veterans Service Center on the Metropolitan Campus with a grand opening last month. Tri-C staff, faculty and students joined a number of dignitaries and government leaders for the ceremony. Located on the fifth floor of the Student Services building, the center includes classrooms for Veterans Upward Bound courses, a computer lab for student veterans, a conference room for Tri-C VUB groups such as the Veterans Today Club and veterans support groups, and a study area and computer testing station. Academic enrichment programs in math, English, science and computer skills are available, along with tutoring services for veterans attending Tri-C.
“The opening of this center now provides the 300-plus student veterans currently attending Tri-C’s Metro Campus a true ‘one-stop’ shop,” said Rick DeChant, executive director of Veterans Services and Programs. Diabetes affects nearly 26 million Americans and an estimated 79 million people are at risk for developing the disease. In observation of National Diabetes Month 2013, the Diabetes Education department at St. Vincent Charity Medical Center would like to debunk some common myths surrounding the disease. Myth or Fact: Does eating too much sugar cause diabetes?